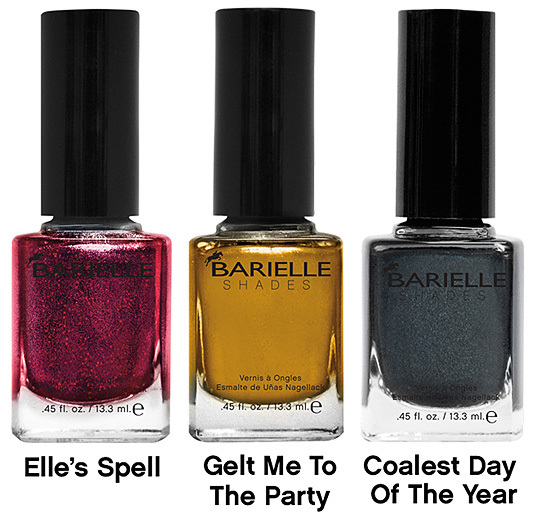 Barielle have done it again, that thing I love ’em for… the twist on the normal. The eclecticness of collections that ensure there’s something for everyone. Taking a generic creme and adding something special to it… they give their shades an edge. Something that makes you want to own them regardless of how many dupable colours you have. MY. ONE. DOESN’T. HAVE. FUCHSIA. GLITTER. IN. IT. etc.. etc..
Elle’s Spell looks positively enchanting…. Gelt Me To The Party looks like it may be the goldiest gold ever and Coalest Day of the Year is a new take on the Winter charcoal/black shades no? Wrap me in Ribbon… again, I don’t think I have a pink *quite* like this, it makes me think of Christmas baubles! If there’s one shade that I’m DEFINITELY lemming this Christmas… it’ll be Jess’ Champagne Toast. I love it when Barielle do the contrasting glitter like that! Snow Day… probably not so much, a pale green metallic? Nah… not for me thanks. 5 out of 6 eh? That’s pretty good going! Come on Christmas, come on Christmas! P.S – I’ve got a special 20% off code for you tomorrow, so if you fancied purchasing a few of these shades… that’ll be the time to do it! OMG, not again! I only just got Aura Angora and the Cashmere one. Now I have to get 4 of these!!!! The discount will be very much appreciated! Jess and Elle are so pretty! Honestly, companies are making us go crazy with the insane amount of releases! They have just let out the Autumn collections, and now holiday! lol I can’t keep up! Char hurry up and purchase please, or demand samples for review purposes haha. I want swatches! :O I want Jess’ Champagne Toast tooo! bad enough you wanting autumn to arrive quick and now christmas? erm, there is THE BIGGEST DAY of the year in between you know? These are SO CUTE. I want Jess’ Champagne Toast! Omg those nailpolishes are gorgeous! Elle Spell is sooo sparkly and pretty. And the gold one looks like melted gold! The purple one I want…I’m loving purple nails at the moment. Those polishes are stunning! I want them all!